Continuing our journey through “a day in the life of….” our Head of PR & Communications, Tamsin spent a day recently accompanying one of our van drivers on his trip, delivering and collecting from some of our shops. Here is her blog of the day. 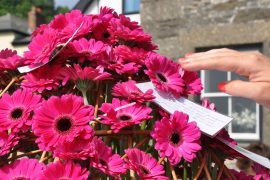 “We’ve got a big load today” says Paul whose been driving for Cornwall Hospice Care for five years. It’s a foul morning with mist and rain and I’m reporting to the charity’s warehouse at Daniels Lane in Holmbush as van driver’s assistant for the day. I’m teamed up with Paul Hancock and we’re heading west. Paul works four days a week, moving donated and new goods around the Cornwall Hospice Care shops. He’s one of life’s gentlemen and within minutes of setting off we’re chatting away as if we’ve known each other for years. We haven’t got to Truro and we’ve already talked about too much salt in food, the evils of plastic, pollution and wind turbines. I also find out that Paul is a vinyl collector, “I’m in to seventies and eighties rock, Black Sabbath and the like. I’ve always loved records, though storage is the biggest problem, and I’m a huge Kate Bush fan.” I resist the temptation to wail Heathcliff it’s me oh Kathy oh come home now! 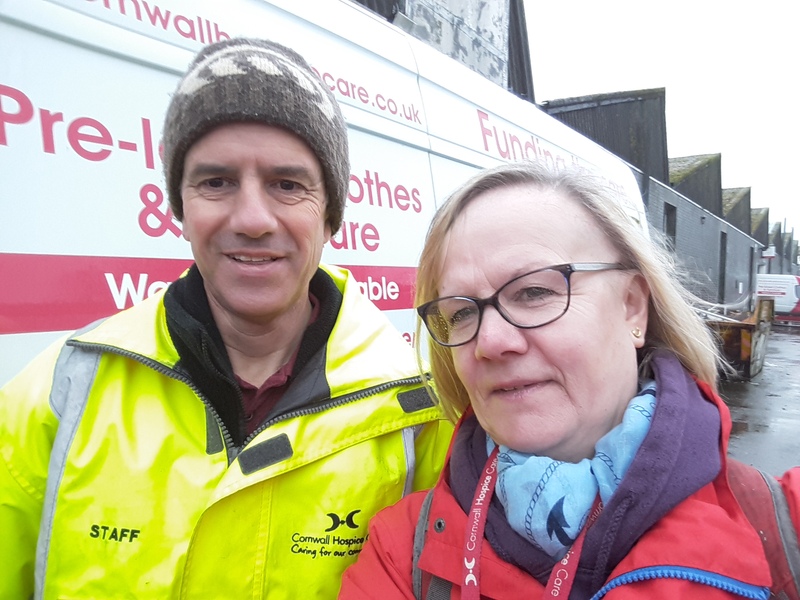 We plough through flood water and driving rain to our first stop at the Redruth community shop where part time manager, Nicky greets us. As we carry in fresh stock and take out bags of donated items to go back to the warehouse, I ask about her team. 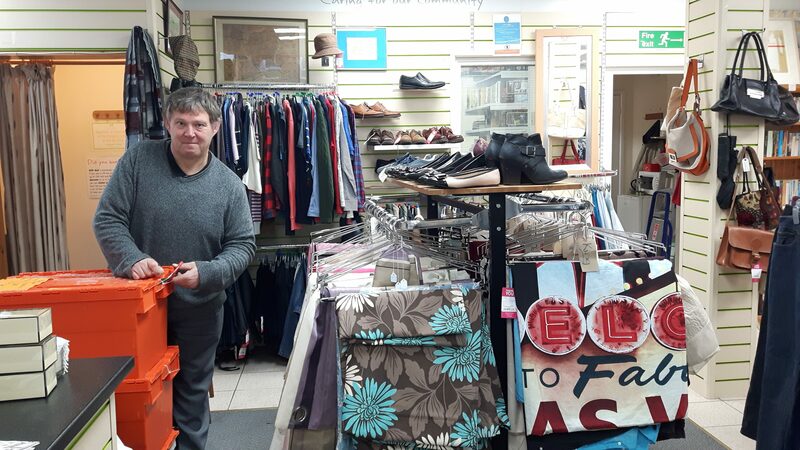 “Volunteers are my world” Nicky says “I value them all and we couldn’t manage without them.” One, Martin, is the recipient of some of the boxes I carry in and he enthusiastically starts to open them up. At the clearance shop in Chapel Street the work really starts as I carry bag upon bag of donated goods up a flight of stairs to the room where later we’ll grab our lunch. But Paul is on a schedule and we’re soon heading toward Falmouth where we have to drive the wrong way up the main street to avoid sewage works. “You couldn’t do without we women” calls one of the shop volunteers as we bring in bags and boxes. 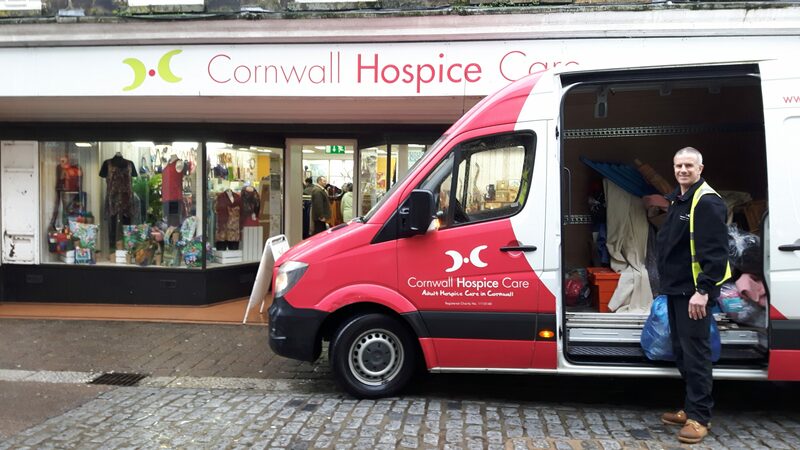 Time for the petrol head stats – we’re in a 65 plate, long wheel base Mercedes Sprinter that’s lovely to drive, (according to Paul), and has already clocked up 57,500 miles on Cornwall Hospice Care work. It’s no secret that I think our vans are fabulous, there’s no missing them in their bright colours, but Paul says they’re a magnet too. Some people wander over to tell him of their links to our hospices, others bring bags of donations to him when he’s parked up having a break! Throughout the day we visit the Retro and furniture shops at Penryn and the community shops at Boslowick, Mawnan Smith and Hayle and I see the rewards Paul gets; coffee and biscuits at Penryn and Boslowick and gorgeous chocolates at Mawnan Smith! I could get used to this and you get to work the calories off. Click here to listen to the recording Paul and I made during our day together. Inspired by this story? Help us continue to provide valuable care.